In the previous Active Directory article, we have seized an Operations Master Roles from the Offline Domain Controller to the New Domain Controller. After this, we have to clean out the offline domain controller data from the new domain controller. This process of removing data in AD DS is known as Metadata Cleanup. NTDSUTIL is used to clean up domain controller metadata. If a domain controller that is damaged and cannot be started from Active Directory service, we can then use NTDSUTIL to clean out the unsuccessful domain controller demotion, and it is very important that you do so. This will solve problems with slow login in domain controller, replication as well as knowledge Consistency Checker (KCC). 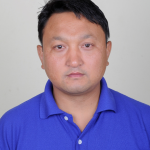 Here, KTM-DC01-2K8.msserverpro.com server is a failed domain controller, which we want to remove. To do this, we will use the NTDSUTIL command line tool. 1. Open a command prompt, type ntdsutil and press Enter. 2. At the Ntdsutil prompt, type metadata cleanup and press Enter. 3. At the Metadata Cleanup prompt type connections and press Enter. 5. At the Server Connections prompt, type quit and press Enter. 6. At the Metadata Cleanup prompt, type select operation target and press Enter. 7. At the Selected Operations Target prompt, type list domains and press Enter. This list all the domains in the forest are listed with a number associated to each. 8. At the Select Operations Target prompt, type select domain 0, where number “0” is the failed domain controller, and press Enter. 9. At the Select Operations Target prompt, type list sites and press Enter. This list all the sites in the forest are listed with a number assigned to each. 10. At the Select Operations Target prompt, type select site 0, where number “0” is the site containing the failed domain controller, and press Enter. 11. At the Select Operations Target prompt, type list servers in site and press Enter. 12. At the Select Operations Target prompt, type select server 0, where number “0” is the failed domain controller, and press Enter. 13. At the Select Operations Target prompt, type quit and press Enter. 14. At the Metadata Cleanup prompt, type remove selected server and press Enter. 15. You will receive a warning message. Read it, and if you agree, Click Yes to confirm removal of the server. 16. Type quit at each prompt to exit Ntdsutil. In addition to cleaning up the Active Directory object using Ntdsutil, we should clean up the DNS records for the failed domain controller. 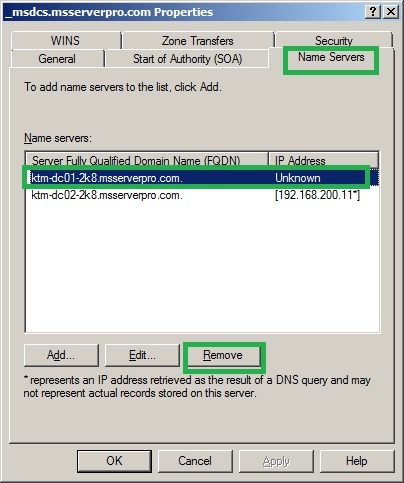 Remove all DNS records from DNS, including all domain controller records, GC server records, and PDC emulator records. 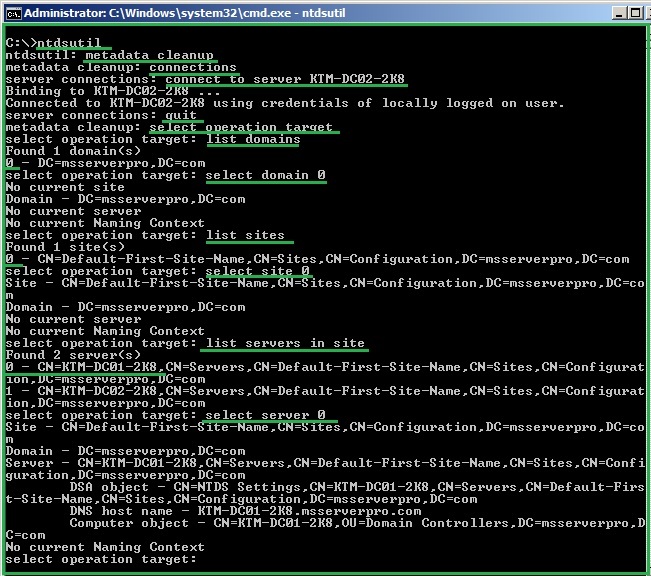 (The last two will exit only if the domain controller was configured with these roles.) 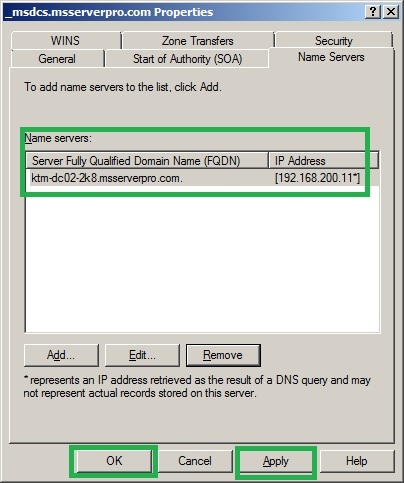 If you do not clean up the DNS records, clients will continue to receive the DNS information and try to connect to the domain controller. This can result in slower connections to Active Directory as clients fail over to use alternate domain controllers. 1. 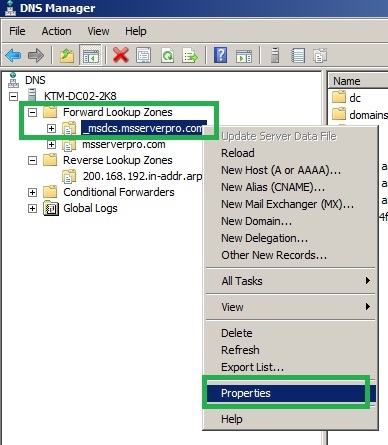 Open DNS Manager, expand Forward Lookup Zones, Right Click _msdcs.msserverpro.com, Click Properties. 4. Right Click on mssserverpro.com, and then click Properties. 5. 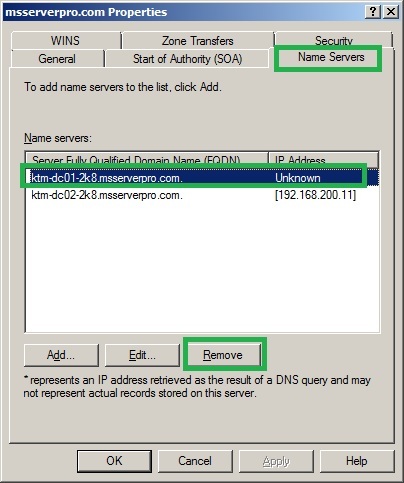 On the msserverpro.com Properties dialog box, Click on Name Servers Tab, select the offline domain controller and Click on Remove. 6. Click Apply and then Click OK.
7. Do the same process on Reverse Lookup Zones. 8. 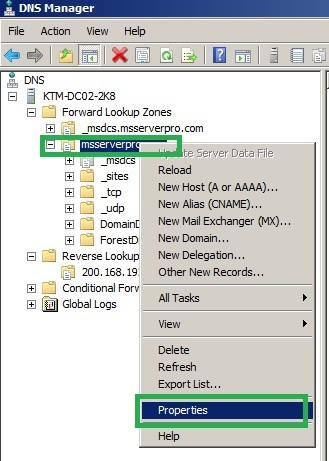 Remove all DNS records (KTM-DC01-2K8.msserverpro.com) from DNS, including all domain controller records, GC server records and PDC records. 9. 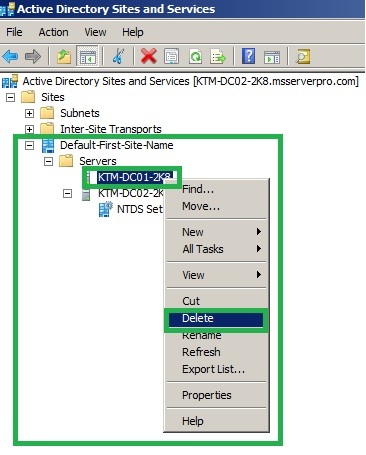 Open Active Directory Sites and Services; expand Default-First-Site-Name, Servers, Right Click on KTM-DC01-2K8, Click Delete. 10. On Active Directory Domain Services dialog box, Click Yes. 11. Close the Active Directory Sites and Services Console. Metadata Cleanup process is very important whenever the Domain Controller is non-functional for business continuity. The above article outlines how to carry out the Metadata cleanup process using NTDSUTIL in Windows Server 2008 R2 and this process also works in Windows Server 2003. I hope this helps. Pingback: Metadata Cleanup Using NTDSUTIL in Windows Server 2008 R2 cleaning up a old server from a good one | Computer Maintenance, Repair and Optimization! Why use the command line if you can simply delete the offending DC in AD Users and Computers and then in AD sites & Services? Then do the manual metadata clean up you list? The reason I comment is a I keep seeing many confusing sites that claim this is the way todo it but other that state the GUI, which is way easier for 99% of the peeps. NTDSUTIL may be the only solution for Server 2003 and earlier but not 2008R2. Excellent tutorial and step by step with full description. Nicely explained….Thanks for sharing it..